Anatomy Physical Therapy (APT) utilises Frequency Specific Microcurrent (FSM) electrotherapy to enhance the traditional manual process of Physical Therapy and accelerate the recovery of old or new soft tissue injuries and many other conditions. This is especially important for athletes and teams who desire a rapid return to sport. At APT, our qualified FSM Therapist has travelled to the United States to study directly with the pioneer of this technology, Dr. Carolyn McMakin, M.A., D.C.. Frequency Specific Microcurrent (FSM) is a form of electrotherapy. It is an exciting new way of treating nerve and muscle pain and many other conditions using specific frequencies and micro amperage current. 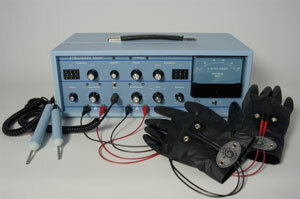 Practitioners of microcurrent therapy introduce a mild electrical current to an area of damaged soft tissue. The current is applied using electrodes that have been either moistened or coated with a gel. FSM can treat chronic pain quickly, easily and comfortably. Neck pain, lower back pain, nerve pain from nerve traction injuries, disc bulges and herniations, pain from arthritic conditions, kidney stone pain and shingles are among some of the many conditions that can be treated successfully at APT. FSM can be used to treat an injury immediately. In fact, if an injury is treated within 4 hours of it occurring the healing process is significantly improved. FSM is also very effective in breaking down the type of adhesions and scar tissue commonly found in old injuries. By applying the correct frequencies, FSM can cause scar tissue to soften enabling the Physical Therapist to break it up without much pressure, generally using the fingertips. As a result it allows a greater amount of scar tissue to be acted upon in one treatment session when compared with the traditional manual Physical Therapy. Following a detailed consultation with you, which involves a comprehensive history review, a qualified FSM Therapist will develop a treatment programme that best addresses your individual needs. FSM is a light touch treatment so there is no painful or deep pressure involved, making it a comfortable experience for the individual. Often we will incorporate some Physical Therapy or Sports Massage Therapy into the FSM Treatment in order to further enhance the end results. FSM’s amperage is similar to the body’s own cellular amperage; therefore, you won’t experience any sensation whatsoever. Benefits of improved cellular function include warmth, softening of tight tissues, emotional release, and reduction of pain during a session. The APT Therapist may deliver FSM through moist towels or thin black graphite gloves. The gloves enable us to have a “hands-on” feel of the response of your muscles and other affected tissues during the session and target FSM to smaller areas such as Trigger Points. Some patients have reported significant benefits immediately after or within 24 hours following a single FSM session depending on the soft tissue injury or illness. Some of these benefits can be permanent, or they may last between four days to a week, with the duration of benefit lasting longer with each subsequent FSM session. FSM can be used to treat an injury immediately. In fact, if an injury is treated within 4 hours of it occurring the healing process is significantly improved. This is especially important for athletes and teams who desire a rapid return to sport. Tissue cells that have been vibrating at disrupted frequencies for an extended period of time tend to habitually return to those frequencies, often within four to seven days following an FSM session. This situation calls for repeated FSM sessions at appropriate intervals. Early intervention generally enhances favorable outcomes with FSM. Good outcomes have also been observed when using FSM for long-standing symptoms, even when other treatments have failed.